Product prices and availability are accurate as of 2019-04-14 06:04:39 EDT and are subject to change. Any price and availability information displayed on http://www.amazon.com/ at the time of purchase will apply to the purchase of this product. The tough, no-nonsense DEWALT DC411B 18-volt, 4-1/2-inch cordless cut-off tool is designed to meet the challenges of everything from rusted rebar and steel I-beams to resilient threaded rod and corroded angle iron. 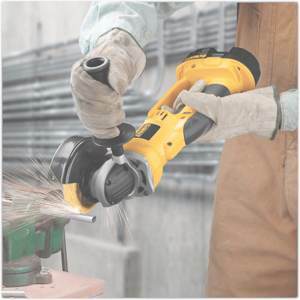 Its 6,500-RPM motor and 4-1/2-inch-diameter cutting wheel are perfectly engineered to cut and grind metal. 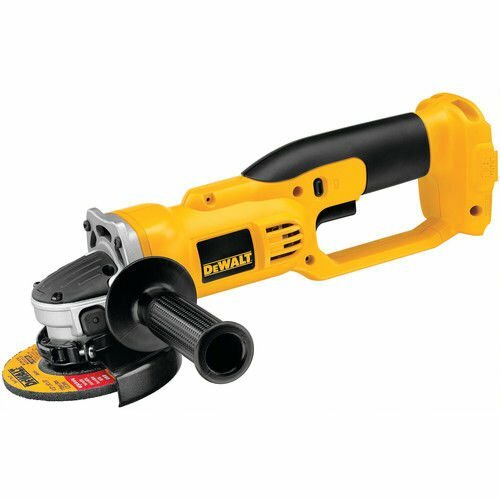 It's powered by DEWALT's 18-volt cordless batteries (not included). Powered by a 6,500 RPM motor, the DC411B's abrasive 4-1/2-inch-diameter wheel will slice through most metals quickly and cleanly. Besides the cutting and grinding wheel, the versatile DC411B will also accept a Zirconia-grit flap disk, stringer wire wheel, and rubber-backed sanding disc, allowing you to clean, smooth, shape and finish a wide variety of materials, including steel, wood and masonry. The DC411B has a low-profile, jam-pot housing that ensures precise gear alignment for a smoother, quieter transmission while allowing access to tight, narrow spaces. A quick-change wheel release provides easier and quicker wheel removal without the need for a wrench, and since there's no cord to drag around, you can work un-tethered anywhere at any height or angle. Other commercial-grade features include a two-position side handle and a large trigger switch with lock-off button. 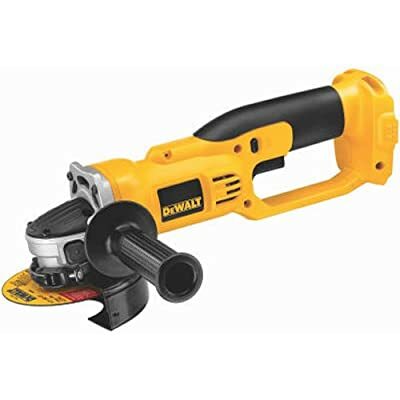 One DEWALT DC411B 18-volt 4-1/2-inch cordless cut-off tool, one Type 1 cutting wheel and safety guard, one wrench, two matched flanges, and one two-position side handle (batteries and charger sold separately). Quick-change wheel release provides easier and quicker wheel removal without the need for a wrench (view larger).